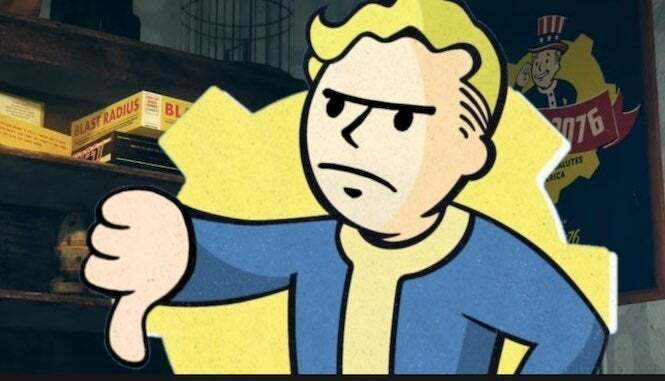 A video has been making the rounds via social media, showing a customer attempting to get his money back on his newfound purchase of Fallout 76. Though he doesn’t disclose why, he apparently isn’t too fond of the game’s new online structure. You can watch it below. Now, at first, the manager is calm, explaining that it’s mainly due to policy. Apparently the consumer didn’t have a receipt, meaning all he can do is trade it in for store credit. At first, the customer lowly lets on that he’s upset over the whole thing, then steps off camera for a quick second as another customer makes his way into the store. But then the rage clearly takes over. The customer begins trashing items within the store, starting with one small shelving unit. Then he charges a stack of digital cards, bringing the whole stand down. He then proceeds towards the door before knocking down another case of games, then takes down one more thing before exiting the store. Meanwhile, the manager, apparently named “Brian,” remains calm throughout, but then answers the phone at the end of the video, as if nothing has happened. But clearly, this is “gamer rage” taken to a whole new level. I also cannot blame him, but I feel really bad for the clerk. We’ll keep you informed in regards to if any legal action is being pressed against the customer, but it appears that the manager was prepared to clean up the mess and, next time, keep security on standby in case someone rages like this guy did. Probably a smart idea.